Why do you earn? To put food on the table, for the roof over the head. Of course, also on what kind of food and what kind of roof and tiles you want your money to buy. Lifestyle costs are an important part of the urban mass affluent life and need to be sustained beyond your working years. The income you bring home has three big goals: managing household costs, the future, and unforeseen circumstances. Getting the mix right between living today and saving for the future is the subject matter of a full financial plan. But there are some rules of thumb that can tell you if you are on the right track. Mint spoke to financial planners to understand some ball park ratios that will tell you if you are doing okay. This is the starting point and getting this right will form the basis of your household cashflows which in turn will define your discretionary spends. Start by jotting down the income you get in hand and subtract a portion that’s earmarked for savings. According to Vishal Dhawan, founder and chief executive officer, Plan Ahead Wealth Advisors, one needs to save 20-40% of the take home monthly income. This, of course, will depend on your life-cycle and responsibilities. “If you have many responsibilities, the savings ratio will be lower. Like if you are a young parent, you will have a lower savings ratio when you are young, but a much higher one when you are in your 50s. But in general, 20-40% is a good range," he said. After you have put a number to how much you will save each month, what’s left are the expenses. Now these expenses can be bifurcated into two main categories. Discretionary and non-discretionary spends. Expenses like paying school fees, rent, insurance premiums, household supplies comprise non-discretionary expenses. You don’t have much control over non-discretionary spends, but what you can control is your discretionary spends like taking a holiday and buying a camera on a zero-EMI scheme or buying an SUV using a car loan or even buying a house on loan. Loans or taking credit gives you a bloated sense of financial worth that can totally throw your financial life out of whack. Imagine driving home an SUV when what you can afford is a small car only because you were eligible for the car loan. Not only will you end up paying huge EMIs for the next few years, the cost of maintaining the car, like insurance premiums and servicing cost, will be much more as well. In fact, this is a classic debt trap. “Many people run into financial difficulties because they believe that the ideal loan ratio is whatever the bank is willing to give to them," Dhawan said. It’s important, therefore, to limit how much you borrow. 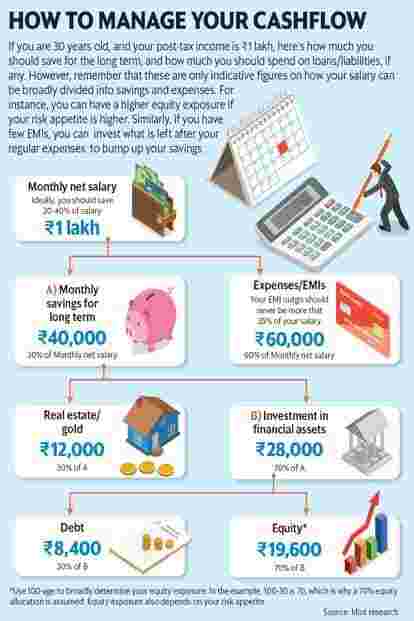 Experts suggest your total EMI outgo should not be more than 35% of the take-home salary. Another way of looking at this is not having a liability that is more than one-third your assets, said Amit Kukreja, founder, WealthBeing Advisors. “Total assets divided by total loans should ideally be 3 or above. Anything less than 3 means watch out and try to reduce the loan," he said. But keep in mind that even within the EMI pie you need to prioritise. For instance, when you take a home loan, you are buying an asset on credit whose value may appreciate in the future and it will get you tax breaks. In comparison, a car’s value will depreciate over time and you pay a much higher rate of interest. Credit card debt and personal loans are much below in this chain. Your calculation of how much to save can go horribly wrong if you don’t make the savings work for you: invest the savings to make them grow. It is important to have the right amount of investments in different asset classes to reach your financial goals. Asset allocation helps in diversifying your risk and prevents a major setback if one category of assets witnesses a downturn. Check these two ratios to see if you are doing okay. Physical assets ratio: India’s fixation with physical assets makes most households laden with gold jewellery with hefty making charges that eat into returns and real estate properties that are difficult to manage and which require huge sums for upkeep. We are not saying that you shouldn’t have physical assets at all, but you need to tackle this bias, “else the rate of return will be below the inflation rate," said Prakash Praharaj, founder, Max Secure Financial Planners. “We have to tell them (investors) clearly that if they want to achieve some goals by getting returns of 10-12%, the physical assets need to be reduced," he added. Your physical assets, mainly including real estate and gold, should not be more than one-third of your total assets, said Dhawan. This does not include the residential property you live in. The remaining should go into financial assets. Debt and equity ratio: Your assets too need to be spread across debt and equity carefully. Too much risk could pose a danger in some situations—for example, using equity for short-term goals—while too little risk might not be enough for your investments—like targeting retirement corpus through a debt-heavy portfolio. Based on your risk appetite and phases of life, financial advisors would suggest different levels of exposure to equity and debt. “A simple way of knowing what percentage of equity exposure to take is to make a 100 minus age calculation," Praharaj said. So a 30-year-old individual can put 70% of her investments in equity instruments and the rest in debt. Similarly, a person closer to retirement should reduce equity exposure. While these are just ballparks estimates, it’s a start to seeing if you are doing okay.